Fleet Skips trades with some of the most important names in the construction industry. If you are working from out of town and are not familiar with the local area, please give us a call on 0800 917 7578. You will speak with one of our friendly team who will be happy to guide you on skip sizes and delivery slot times. Fleet Skips has built its reputation on fast delivery and collection coupled with excellent rates and a helpful and dependable service. Our staff have decades of experience and expertise in waste management and work hard to satisfy all your specifications for the job. Based in Dartford, Kent, we are close to all major road routes and can quickly and efficiently reach our customers. Our drivers use state-of-the-art navigation devices, and most have local knowledge of the areas we cover. Say goodbye to tiresome trips to the tip by hiring one of our skips. At Fleet Skips, in Dartford, Kent, we offer a reliable skip hire and delivery service so that you don’t have to worry about the waste left over from your building project. Choose to rely on our highly regarded team from a skip hire company you know you can trust. Whether you’re looking to move your old sofa or large amounts of building debris, turn to Fleet Skips for safe and efficient skip hire services. Choose our waste disposal services for same-day delivery and 1- to 14-day hire terms, with the option of longer hire periods if required. 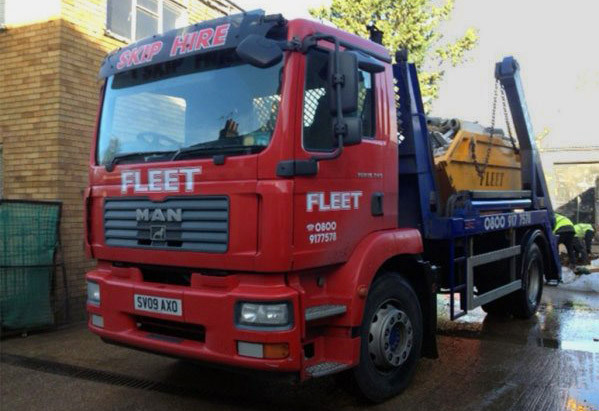 Fleet Skips in Dartford offers skips varying from 4 cubic yards to 12 (all sizes are approximate). Also, our vehicles are prepared to the highest standards, and our drivers provide a friendly and efficient service at all times. Have a glance at our skip size guide for more details on the vast array of skips ready for hire. You can select from our midi skips, or builders’ skips – we are bound to have the right skip hire option to suit all your skip hire needs. Contact us now, in Dartford, Kent, to find out more about our skip hire and delivery service.